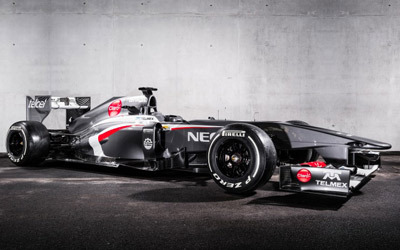 Sauber have today unveiled their new Sauber C32 Ferrari at their headquarters in Hinwill, Switzerland. The short launch event was mainly focused at presenting the new driver lineup, a young duo who were given the opportunity to remove the cloth from the new, grey Sauber. The roll-out of the Sauber C32 will take place during the first winter test at Jerez de la Frontera on 5th February. Test and reserve driver Frijns (21) spent last year competing in the World Series by Renault – and crowned his season with the championship title. “I’m overjoyed that the Sauber F1 Team has given me this chance. I will do everything I can to support the team as effectively as possible and, at the same time, learn how things work in the professional world of Formula One,” said the Dutch youngster.